The trunked radio system is designed with disaster recovery in mind; it will provide emergency voice communications in the event of a total telephone system failure. Radios can be programmed for Talk Groups, a group of radios which appear as a private radio network even though they share a common radio system. Radios can be programmed with multiple talk groups. If necessary, these talk groups can be shared between departments. Radios come equipped with one battery; additional batteries are available for purchase. (DoIT will replace the original battery at no charge if it fails within one month of acquiring service.) Radios must be returned with a working battery upon termination of the contract. Departments may rent radios on a monthly or daily basis. Daily rentals are reserved on a first-come/first served basis and are subject to availability. Two-way radio services incur a monthly access charge and lease for every radio. Additional fees (including third-party installation for vehicle installation) may be incurred. View the Two-Way Radio Equipment page. The radio access charge is in addition to equipment costs for every radio. 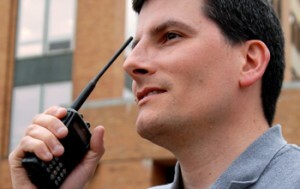 Go to doitservices.missouri.edu to request Two-Way Radios. Login to the self-service portal with your University user id and password, select Service Catalog, and search for Two-Way Radios.